The best time for diving on Socotra is the period from September to October and from March to May, when wind falls and the sea calms down. We have pleasure in organizing diving tours for you on Socotra. We offer you to take advantage of professional knowledge of Fouad Naseeb, the only certified dive-master on the island, who has been studying the Archipelago’s undersea world for many years. One of the most interesting diving sites is the “Sunrise” wrack lying at a depth of 25-27 meters at the sandy bottom in Shuab Bay. The “Sunrise” ship created an artificial reef almost in the very center of the bay, which sandy bottom and moderate depth (not more than 30 m) attracts countless numbers of sea dwellers. Here one should be careful of skates reaching up to 3 meter in diameter. 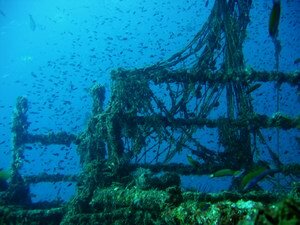 The old fishing nets entangled in the ship’s gear also represent a danger to divers. Sometimes there are strong currents and low visibility. But in February-March the sea gets very calm and it is quite possible to watch tens of fish species schooling around the wrack. This wrack is worth staying one more day in Shuab Bay to make a few dives. Eastern Cape Ras Di Erissel is the place where numerous ships have been colliding with the rocks covered by the water area of a few square miles for centuries. These are an improper mapping of the island, strong winds and very heavy currents combined with a low visibility of this area that caused hundreds or maybe even thousands shipwrecks here. The whole of the shallow water area is covered with the fragments of ancient ships. 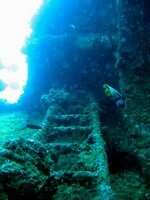 There are also a few big recent and fairly preserved shipwrecks that remain insufficiently explored for the present. The place has 7 diving sites. Dihamri Marine Protected Area is famous for a great variety of corals and fish species. It has five diving sites with the deepest dives up to 50 meters. Night dives are also possible. Rosh Marine Protected Area is famous for a reef stretching for about 1 km off the coast. It has one big diving site with dives between 10 and 15 meters. Night dives are also possible. Adho has 2 diving sites with dives up to 30 meters. We arrange both full diving trips and a few dives in a couple of Socotra’s beautiful places combined with a trip to Shuab Bay, for example. The best season for diving on Socotra - October-November, March - May. The sea is calm at the time and visibility is good. AOWD scuba diving certification level is at least required. Arrival to Socotra.Transfer to Hadiboh, hotel accommodation. Transfer to Qalansia settlement. Two dives to the “Sunrise” wrack in Shuab Bay. Coming back to Qalansia, having specially prepared fish supper and spending the night in the camping (tents) of Detwah Lagoon, which is definitely one of the most impressive places on the island coast. Two dives to the “Sunrise” wrack in Shuab bay. Transfer to the north-eastern part of the island and staying at Rush camping. Two dives from boats not far from Rush. Having supper and spending the night in the camping (tents). Two dives from boats to the wracks at the Erissel Cape. Having supper and spending the night in Rush camping. Coming back to Hadiboh, spending the night in the hotel. Sightseeing tour to Dixam Plateau famous for Dragon Trees. Going down to the canyon, swimming in a natural pool. Transfer to the airport for a flight to Sanaa. Arrival to Sanaa. Guided tour to Wadi Dahr (the palace of Imam's family), shopping in Saana, having a rest in the hotel. Transfer to the airport for a flight back. Diving & on Darsa and Samha islands. Diving with mantas! To make this trip we rent two fishing boats for a few days and except the islands we plan to explore a 30-km NET Beach, which is practically inaccessible from inland, and beautiful cliffs of South-West Socotra. The trip is going to be creatively different. Diving in a company of mantas you will be able to feel like real explorers of the Archipelago’s underwater world. NEW! From 15 to 25 October we organize dive expeditions to islands Darca, Samha and Abd al-Kuri. Remaining two vacant places!